Well, it’s that time of year again. I always enjoy the holiday season as a time to see friends and family as well as a time to relax and enjoy a little time off from work. It’s very easy to let yourself get caught up in all the holiday hustle and bustle, but with just a little effort you can avoid getting stressed out. Is it really OK to fight over the last Tickle me Elmo with the lady that parked next to you in the parking lot? Of course not!! But too often, especially around the holidays, we allow ourselves to act just like that over a variety of things. Most of us, in retrospect, would say we acted foolishly in those instances too. The Inaugural 2007 NSDA point series was entertaining from start to finish. Some class championships were locked up early, however there were some hugely dramatic battles down to the wire. Here is a look at the top dogs in the points hunt from 2007. The Soboba Casino in San Jacinto, CA was the site for NSDA’s 2007 Season Finale November 9-11. Cool temperatures and tight points races were the big stories of the weekend. 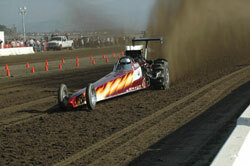 These factors led to some of the closest and most exciting sand drag racing ever seen. As the holidays approach, you usually set back with some time to reflect on the year past. This past year I’d have to rate as a great one for me. From a strictly racing perspective, it was personally my best season ever with a third track championship at WMSD. For that I am certainly grateful for all of the good luck sent my way; however when I look back on 2007 the biggest thing in my mind is how NSDN was started from scratch and has grown in only its first year of existence. It was an undertaking that I could not have done by myself. You, the readers, probably can figure out who those people are but I’d like to personally thank these folks. 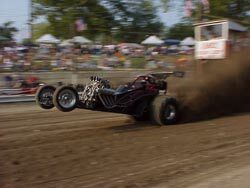 It’s hard to believe that the Midwestern sand drag racing season has been finished for nearly a month now. This past summer really flew by. If you’re like me, it’s hard to stay indoors even when the mercury starts to drop. Holidays and indoor activities that took a back seat to racing earlier in the year seem to be business at hand though it’s still hard not to get involved in some type of winter activity involving an internal combustion engine. 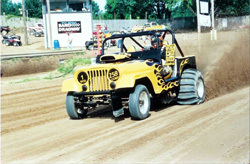 The guys and girls who live up north and frequent the Michigan tracks have their snowmobiles to bomb around on. I’ve also recently learned that the ATV racers stud their tires and head out to the nearest frozen lake for some ice drags.